Please come and visit me in my new studio E2R upstairs at the Holborn site. 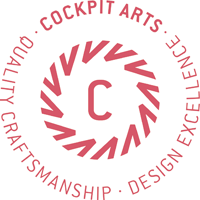 Cockpit Arts' Open Studios happen twice a year; see behind the scenes, meet 170 makers over two sites. I will be exhibiting at Ceramic Art London for the first time - come and see me on Stand 30. Vessel Gallery will be showing my work at Collect this year. HOMO FABER 2018 in VENICE. Welcome to the first major exhibition showcasing the very best European craftsmanship and its link to the world of design. As today’s technology-driven society pushes us to move faster, consume more and think less, Homo Faber invites you to slow down, take a breath, and meet the people choosing a different approach. Discover the unique contribution to our modern world made by master artisans, the remarkable craftsmen and women using their hands and minds to create exceptional objects of lasting excellence. Come and experience the human spirit and talent of man the maker: Homo Faber. Come and visit me in my studio at Cockpit Arts for our Summer Open Studios. You can meet 80 other makers and see behind the scenes in the studios, as well as buying work directly from all the craftspeople. Meet 170 makers at two Cockpit Art centres in central and south London. Visitors can see behind the scenes in the studios and buy work direct from Cockpit Arts’ master craftspeople and artist-makers, past and present. One Marylebone, 1 Marylebone Rd, London NW1 4AQ. Following the storming success since its launch in 2015, Handmade in Britain will return to Kew Gardens for the third edition of HANDMADE AT KEW in October 2017! Constantly evolving, always thought provoking; trade show Tent London has carved out an impressive reputation as an anchor of London Design Fair, a beacon for anyone looking to discover the best contemporary design. Meet 170 makers at our two centres in central and south London. Visitors can see behind the scenes in the studios and buy work direct from Cockpit Arts’ master craftspeople and artist-makers, past and present.